An assortment of foliage plants and blooming plant(s) in a wicker basket and decorated for Easter. 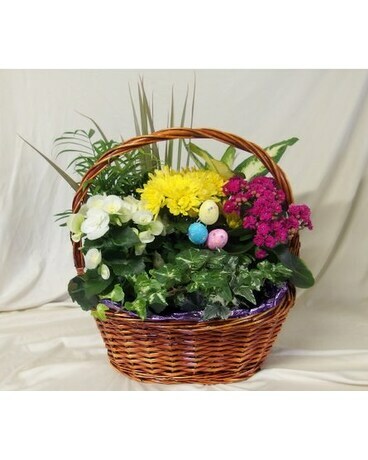 An assortment of foliage plants and blooming plant(s) in a wicker basket and decorated for Easter. Each one is made individually in our greenhouse. The garden sent will differ from the picture. Plants used may include violet, begonia, kalanchoe, annual plants and foliage plants.